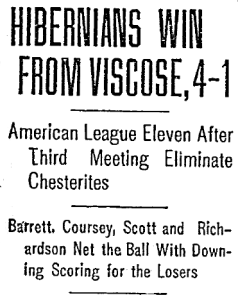 Playing at Stenton Athletic field at 24th and Westmoreland Streets, the Christmas Day replay between Hibs and Viscose was a back and forth affair that finally ended in a 3-3 draw. The teams would meet again for the third replay on New Year’s Day at Potter’s grounds at Front Street and Erie Avenue with the winner advancing to face Bethlehem in the third round of the tournament. Wet weather had meant the second round replays, originally scheduled for December 18, had to be moved to Christmas Day. That wet weather continued in the lead-up to the Hibernian-Viscose replay on New Year’s Day, the Inquirer describing in its match report on January 2, “The grounds were in poor condition, one-half of the field resembling more of a mud heap, which handicapped the players.” Like many of Philadelphia’s parks, baseball was played on the Potter’s grounds in the warmer months. Now, the baseball diamond was a sea of mud. The second goal, which came from the foot of [outside right] Coursey, was one of that kind where it tries a player to find out if he lacks the grit. [Center halfback] Jacovelli had placed the ball in a favorable position, though it was well out of reach of his forwards, but Coursey, coming along with a wet sail, nipped between the two Viscose full-backs while they were studying who should clear the ball, Coursey scoring without the least difficulty. It was a good bit of work on the part of the Hibernians right winger, who proved that he can make his own openings when it is necessary. Attacking into the mud in the second half with a four-goal deficit to make up, Viscose “appeared to brace up somewhat, for right from the beginning they kept plugging for the Hibernians’ citadel.” Not that the Hibs let up themselves, with Barrett having three shots stopped by Viscose keeper Chew. 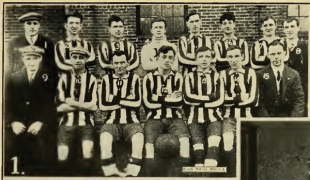 In the closing minutes of the game the pressure from Viscose finally paid off when inside right Downing “netted with a beautiful shot which was labeled all the way.” The Inquirer described, “It was a well executed goal, in which practically the whole forward line had taken a hand in, Viscose being well deserving of the score.” But that would be the only goal scored by the Marcus Hook team, with Hibernians winning the contest, 4-1. With the victory, Hibernian advanced to face Bethlehem in the third round of the National Challenge Cup. The teams, both members of the city’s professional American League, would meet on Saturday, January 15 at East End Field in Bethlehem.